Tami Oldham arrived in Tahiti, in 1983, with the mind to see the world. She worked at a marina, conditioning and cleaning boats, and that is where she met Richard Sharp, a young man who had built his own boat while working at a ship yard in South Africa. Richard was passionate about sailing and the sea. Being kin spirits, they began dating and fell in love. Then, they began planning to travel the world in their boat, starting with Japan. A chance encounter—with a couple Richard knew—would alter Richard and Tami’s plans, for the couple asked Richard, as a favor, to sail their boat (the couple’s) from Tahiti and deliver it in San Diego, California. They would pay the expenses of the two return tickets, first class, plus ten thousand dollars. It was October. The voyage would take twenty-one days of smooth sailing, but what started as a dream come true, soon became a nightmare when they were trapped in the middle of a monster hurricane that took a toll on them and the boat. Adrift, with scarce provisions, they had to make do until they died or were rescued... whichever came first. Tightly edited at 96 minutes, Adrift is a more action driven and more commercial All is Lost. It has the benefit of being more beautifully shot too, taking advantages of gorgeous sunsets in the ocean, aerial views of the boat at the mercy of the ocean, and nature shots of beaches, ocean, and waterfalls, in what may or may not be Tahiti. Adrift is based on a true story, starring Shailene Woodley as Tami Oldham, and Sam Claflin as Richard Sharp. It is written by Aaron Kandell, Jordan Kandell, and David Branson Smith, and is produced in part and directed by Baltasar Kormákur. 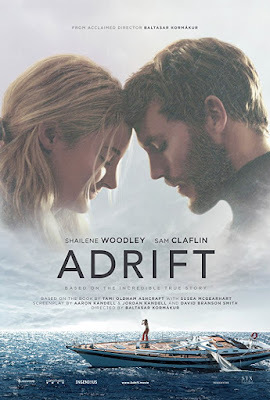 Adrift moves back and forth between two timeframes: five months earlier in Tahiti—the time when Tami and Richard first met, got to know each other while they romanced, and decided to travel the world together—and the aftermath of the monster storm that left them adrift at sea. Both storylines more or less converge in the middle, right at the center of the monstrous category 4 hurricane Raymond, one of the worst storms in recorded history. This narrative choice was very clever and contributed to heighten the tension—aided by acoustic score—while the audience got to know and feel for the characters’ fates. There is a twist towards the end that made the story even more poignant and bittersweet. The romance between Tami and Richard—Shailene Woodley’s and Sam Claflin’s characters—was beautiful, and Woodley and Claflin had great chemistry together. They imparted passion and sweetness to the romance, and both conveyed the quiet desperation of contemplating the odds that they could (and probably would) die at sea. They looked awfully battered, shipwrecked. Shailene Woodley has given in Adrift her best performance ever, more so than in The Descendants and The Fault in Our Stars. Woodley imparted her character with nuance and authenticity, as a fearless adventurer who refused to be defeated in the face of adversity and came out the better for it. Adrift is, together with Tully (See Snapshots -#51), Disobedience (See Snapshots -#50), and The Children Act, among the best movies I have seen thus far this 2018 cinematic year. Another great review Carmen. I must see this one. Thanks, Judy. I hope you enjoy it. We saw this last night on DVD. I liked it, husband thought it was a bit slow but liked it by the end. I have to tell you, that twist really threw me! That's very high praise. It certainly sounds like a film worth seeing. I've been impressed many times by Shailene Woodley's work. I thought she was very good in Big Little Lies. I agree that she was very good in Big Little Lies. How awesome that you are into sailing as well, Susan! :-) Yes, an all around excellent movie, though most movie goers didn't think so. It is beautifully shot and well acted too. Did you see Robert Redford's All Is Lost? Yes we did see All Is Lost when it came out. Interesting & nerve-wracking film too. Quiet! My husband is always correcting little things in boating movies : like what you would not do /or how they tie up the boat / or how they handle it etc. Jumping onto a floating cargo object is not usually wise, ha. But it's interesting to watch what he's willing to do as he boat begins to sink. We are still awaiting the sailing movie: The Mercy. Have you seen it online anywhere on how to see it? I did not know of that movie, but I'll make a note to look for it and will let you know where to find it if I do so first. I want to see this movie. Good to hear you enjoyed it! Not heard of this one before but I think I would like it. I, too, think you would like this one, Lynn.